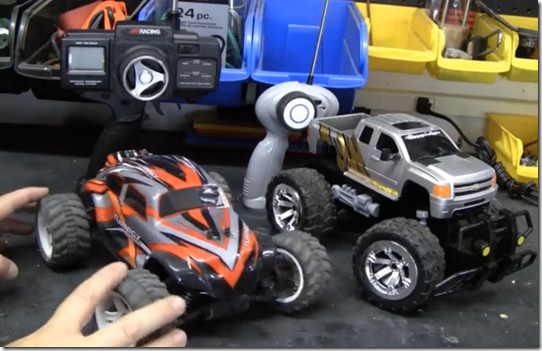 I found gathering all the info needed to dive into RC cars as a hobby kind of confusing. It helps a lot to have a mentor that you can ask questions but that is not always possible. I’m cheep, I will never spend twice the money on anything just to get a brand name. I love digging around and finding the best deal. When it comes to RC you can spend a whoooole lot of money to get started, I estimate that it cost me about $150.00 to get a good quality RC buggy, batteries, charger, TX and RX (Transmitter and Reciever). This is dirt cheap compared to the $500.00 + dollars to get in with some of the high profile name brand kits. I shopped around, bought some of my stuff used, and found online vendors that were not in it to rip me off. One of the more confusing aspects of RC is that a lot of times things are sold separate and its hard for the beginner to know what’s needed. Here are the essentials. RC Car: you can get just the car with nothing else, I prefer to get a car that includes at-least the steering servo, motor, and ESC. LiPo Battery: Usually RC cars use 2 cell LiPo batteries, the current and C rating of the battery will depend on your ESC and motor size. LiPo Battery Charger: LiPo batteries need special love and feeding otherwise they can be damaged or burst into flames. A Balance-Tap LiPo charger is required and often require an external power supply. Transmitter batteries: Often transmitters use quite a few AA batteries, investing in some high quality NiMh AA batteries is a good investment. This info is just the beginning. I will try to dig deeper into some of the RC subjects later!